By the time you finish reading this and going through the exercises, you’ll have a very good idea of whether or not you are on track to reach your retirement goals and what you can do to improve your situation. Who Should Plan Out Their Retirement and When? You and everybody you know. I don’t care if you are a multi-kazillionaire. If you don’t want to have to worry about your financial situation now and in the future, you have to plan your retirement. I think I can best bring home this point by sharing a little story. In the mid-90’s I sat down with a very successful small business owner who wanted to know if he was on track or not. We’ll call him Mr. L. He told me that he had assets worth more than $4 million, he earned over $400,000 a year and had no debt. At first glance, you might think that a guy in that kind of situation would be in great shape. He certainly felt he had nothing to worry about. But I asked a few more questions and then told him that if continued doing what he was doing, he’d never be able to retire. Why? Because while he earned $400,000 a year, he spent $700,000 a year. That meant he was spending down his retirement nest egg and he wasn’t even retired yet. Frightening. On the other hand, when I first started my career I met a garbage man who could retire whenever he wanted. We’ll call him Mr. G. He was in his 50’s when I met him and he had a fascinating story. He started putting money away for his future since he first climbed on the back of that smelly truck. Of course at first, he couldn’t afford to sock that much cash into savings but he did the best he could. 30 years later, he had amassed a net worth of $3 million, no debt, and was living off of his real estate revenue. There are many differences between these two individuals and we’ll explore this throughout the guide. But the point I want to illustrate here is that Mr. G started planning as soon as he began his career and Mr. L didn’t. It’s obvious that Mr. L’s problem was spending. But you have to ask yourself why he had that spending problem. And the answer is, because he never did any planning and didn’t understand the crucial relationship between assets, income and spending – something we’re going to cover extensively. So, in answer to the question, who should plan their retirement and when should they start? The answer is you and now. For most of us, retirement planning means estimating what the future is going to look like. Even if you are retired now, you still need to get a sense of what your retirement will cost down the road. That means, for all of us, we’re talking about predicting a future that is full of unknowns. Not only are they currently unknown, they are unknowable. How long will you live? How much will it cost you to live? What about health expenses (routine and otherwise)? Where will you live? How long will you work? How much will your investments grow? These are all things which are impossible to be sure of. For many people, this is as far as it goes. They stop right here because they (rightly) understand that they can’t predict the future so why even bother (wrong conclusion). Their solution is to do their best and hope for a good outcome (a very dangerous strategy). What I suggest instead is to take a scientific approach and create a plan which may not be perfect but is far better than having no plan at all. That’s what we’re about to do together in this guide. Sure, you may shoot for the stars and end up on the moon, but it’s better than never leaving orbit. Right? a. Estimate the future based on what you know today. b. Revise as the situation changes. c. Re-run your plan every few years even if your situation doesn’t change just to make sure you are still on track. Is it perfect? No. Is it better than nothing? “Abso-Pilgrim-lutely”. What’s Involved In Planning Your Retirement? a. Will you be able to retire without going broke? c. What do you have to do today in order to improve your situation? Am I right in thinking that once you have the answers to these questions, you’ll feel pretty good? Of course. In order to answer these three big questions, we have to first have to get clear on your priorities and then build your plan around it. And the big priority trade-off is time vs money. In other words, is it more important to you to retire sooner (and are you willing to save more and live on less when you retire) or is it more important for you to live and retire in comfort and are you willing to work longer as a result? We’ll talk more about priorities shortly. Once you are clear on your priorities, we’ll look at the three key components of your financial security; income, assets and spending. In order to plan out your future, we’ll look at each one of the these topics and project out what they might look like when you retire and how that might impact your retirement. Don’t worry. This might seem like gobbledygook right now but I’ll break it down and you’ll get it. And through this guide, I’ll walk you through each step of the process. We’re about to get started building your retirement guide. But before we do, I want to reiterate and clarify what’s on the line here. Nobody knows what the future holds. Nobody knows how long their future stretches out. But if you allow that to be an excuse for not taking action, you won’t have a plan and you’ll basically have to take whatever life throws your way. But if you are willing to roll up your sleeves and do the work, you’ll have choices. You’ll have more power to decide when, where and how you live for the rest of your life. You can decide if you want to travel, when, where and how much. You will have more resources to help your children if you choose to and to secure your family’s future. And you’ll have the peace of mind knowing you did everything you could do to fulfill your responsibilities. Does it get any better than that? I don’t think so. If you do this work, I can’t promise that will have everything you want. But I guarantee you’ll have a lot more of what you want than if you ignore this work. I’ve been working with clients for almost 30 years and I’ve never met a single person who regretted planning their future and then taking action on that plan. Sure it takes a little time and maybe includes changing some savings, spending and investing behaviors. But in my experience, this is a very small price to pay in exchange for the freedom most people feel after taking back control over their financial life today and in the future. Let’s get on it. What follows is a step-by-step guide to help have a worry-free retirement. I urge you to take your time with this guide. Print it out. Read it thoroughly and go this each step one at a time. This isn’t a speed race so don’t rush. If you are in a relationship, please include your life partner in this journey. I guarantee you find it a game changer. With that said, let’s get to step 1. Before you embark on a journey, you need to know where you are going. Not only that, you need to know when you want to arrive there and in what condition. The same criteria applies to your financial future. Since this is about retirement, I’ll assume that your goal is to make work optional at some point. The question is, when and what will it look like. To get clarity on a few of your central retirement goals, please complete this sentence,” I want to make work optional when I reach age ___ and I want to be able to spend $_________ per year during retirement.” When you answer this, don’t think about the limitations. And don’t hesitate because you don’t know exactly when you want to retire or because you don’t know exactly how you’ll generate retirement income. Be realistic, but dream a little. We are just putting together a target to shoot for and it’s not written in stone. We can always change things later on. For example, let’s say you are 55 now and feel like it would be nice to retire at 62 but you aren’t sure if you’ll be able to do so. That’s OK – use 62 as your answer for now. And following along with this example, assume you currently earn $75,000 a year after tax. It would be reasonable to want that amount +/- during retirement. But unless you have very unusual circumstances, it would be unrealistic for someone with that kind of current income now to plan for a retirement with twice that amount. My experience tells me that people spend 25% more or 25% less once they retire but that’s usually about it. Again, your situation is unique. So like I said; dream, but be reasonable. It would be great if you only had one financial goal but that is probably not the case. And your non-retirement goals impact your retirement goals because they all cost money. If you are like most people I know, you have multiple goals like investing in your home, maybe educating your children, travel, health care needs and yes…..retirement. As I said, all these goals cost money and compete with one another for your attention and money. That’s why you assign a cost to each of these goals and determine when you’ll need the money. After you do that, it will be time for you to prioritize each goal. When you “dollarize” you put a price tag on your future goals – you approximate what something costs. This isn’t an easy task for most people. Most important goals are things you want to achieve in the future and it’s impossible to know what things are going to cost 5, 10, 20 or 30 years down the road. So you can’t dollarize your goals perfectly but you can still make this exercise meaningful and it isn’t even that tough to do. Just take the current cost of each goal and inflate it. a. Google “total cost UCLA per year”. When I did, I learned that it costs $34k per year for California residents to attend UCLA per year and $62k for non-California residents. b. I found that the cost of going to college went up 5% on average per year, over the last decade. c. Now, all I have to do is use a future value online calculator and figure out that what costs $34k per year now will cost approximately $67,000 14 years from now. This tells you how much money you’ll need when baby Chelsea heads off to college. Now all you have to do is use the same online calculator to figure out how much money you need to save each month in order to hit that goal. See how easy that was? Go back and do this exercise for all your big goals. You’ll be happy you did. Even if you don’t know exactly when you’ll need the money, put your best estimate down. Same as above. You may not know exactly what your goal will cost but estimate it anyway. Of course the further away the goal is, the more difficult this will be. For those goals which are far into the future, I suggest you take the current cost of the goal and inflate it. See the section above on “dollarizing” your goals. Hint: You don’t know (yet) how much you’ll need for retirement and we’re going to get there in short order. Use a plug number for now and once we work up your actual number, you can come back and adjust. The further away your goal, the more difficult it is to estimate the return. I used 2% – 3% for short term goals and 5% – 6% for longer term goals. You can read more about estimating returns and matching up investments to financial goals in this guide. 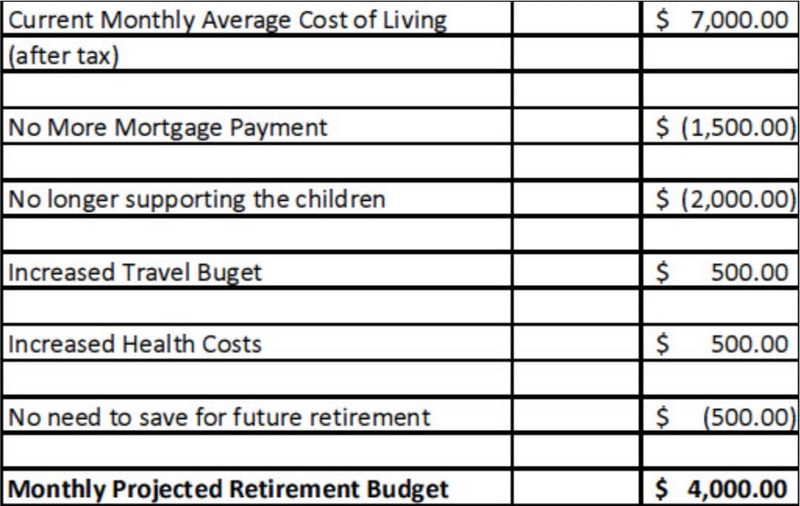 In this example, you need to save $3116 every month (between your retirement accounts and your non-retirement accounts) in order to achieve your goals. Was that painful? I bet not. What To Do In Case You Can’t Save The Required Amount? If you were in the shoes of the person in this example, you might find saving $3116 every month difficult. It is a lot of cabbage. If you are in a situation where you can’t save the amount you need to, don’t worry. We aren’t nearly done. You have a lot of options. The easiest thing to do is find lower cost alternatives and/or use longer time periods to accumulate the money you need. Rather than sending Chelsea to a $200,000 school, would a $150,000 education work? Rather than retiring in 20 years, would you consider working 25? If you buy CD’s consider purchasing callable CDs. These are long-term bank deposits that pay investors much higher interest. The catch is that you tie up your money for a very long time. Not only that, the deposits are callable. That means the bank can pay you back your money at certain intervals and then stop paying the interest. When would a bank call the CD? When interest rates go down. Seeing as how it’s almost impossible for rates to drop further, the odds of having your CD called are low. The bigger risk with these deposits now is if they don’t get called. That’s because if they don’t call the deposit, you’ll be stuck with a very long-term investment paying very low rates when (not if) interest rates rise. As you can surmise, I’m no fan of these investments, but it is one way to get a heck of a lot more interest than current CDs pay. What are preferred shares? They are a hybrid investment — something between a common share and a bond. Preferred shares are like bonds in that they have a stated interest rate the company pays. They pay higher dividends than common shares do, and share values don’t fluctuate as much as common shares do. That’s because the interest payments preferred shares pay keep the prices more stable. The downsides of preferred shares is that they rarely get the upside growth that common shareholders earn, and they carry more risk than bonds. That’s because the bond holders get paid before preferred shareholders get paid. In fact, the companies have no obligation to pay the preferred share interest. That’s the risk the preferred shareholders take, and that’s why the preferred shares get very high interest. Still, if your main goal is portfolio income, these can be attractive. This is one of my favorite ways to generate portfolio income – and it’s one of the least utilized methods. Using this approach, you create a portfolio that fits your risk tolerance and you withdraw 4% every year. You can withdraw that income on a monthly, quarterly or annual basis. But you take the money out no matter what the portfolio earns. Sometimes you earn much more than 4%. 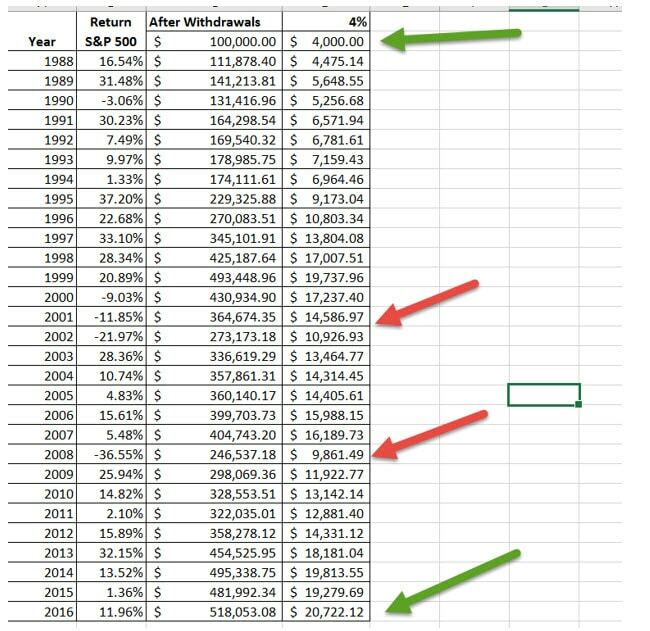 In those years, your portfolio grows because you only withdrew 4%. Other years, you’ll earn less than 4% or even lose money. In those years, you still withdraw 4% of the value. (In those years, since the value is lower, your 4% withdrawal is lower than the previous year because the account value is lower. That’s the best way to cope with withdrawal strategies in a bear market. This is a great strategy for folks who are interested in very long-term portfolio income and the best income investments. In fact, multiple studies show that this strategy is by far the best way to create income over many years. It’s the best way to grow your income to overcome inflation. And over a very long period of time, you simply must create income that grows as inflation grows. I’ll talk more about this in greater detail below in the “Retirement Income” section. Don’t get me wrong. The approach I outlined above is fantastic but it puts undue pressure on you and here’s why. If you think about it, you see that you only need to save that $3116 for 2 years. Once you’ve saved enough for that car, your savings needs drop by $996 a month. Then, once you’ve saved up for the house, your savings needs drop another $972 a month. So over time, your savings needs fall. So what I don’t like about the above idea is that it’s a mismatch. It calls for a higher savings rate when people are least able to do so. Usually people are able to save more as they get older and climb the ladder of success in their professions. So the model above piles on the pressure and in many cases, for no good reason. A more appropriate approach for many people is to focus your savings towards only 2 goals at a time rather than all of them. One being retirement and the other being the goal that you need to achieve soonest. Let’s say you can save $739 in your retirement plan no problem. And in this example, let’s say you have another $1000 a month you can put towards your other goals for the next couple of years. And after two years, you figure you will advance at work and will be able to bump up your monthly savings to maybe $1500 a month. 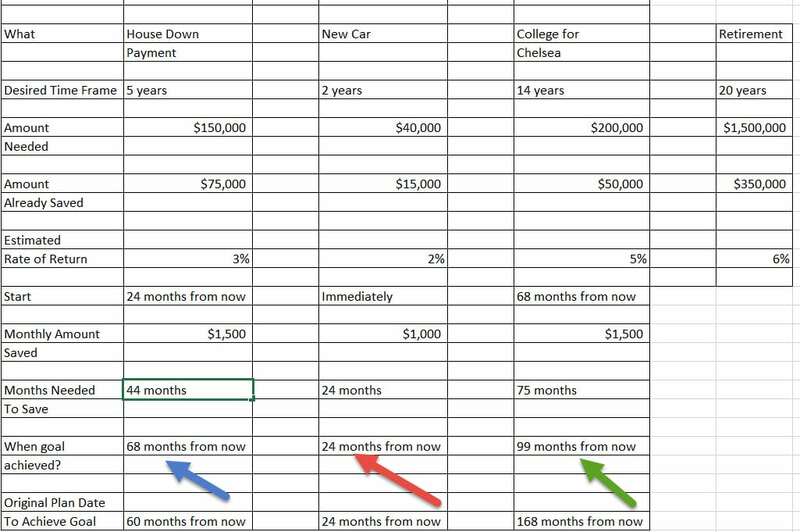 You can see that it takes 2 years to save up enough for your car (red arrow) – exactly as planned. But starting two years from now, it takes 44 months to save enough for the down payment for the house – which is 68 months from now (blue arrow) instead of the 60 months you planned for. In other words, it takes you about 8 months longer to save up for the house down-payment than you originally planned. Who cares? It’s not the end of the world. If it’s that important, find ways to save more or just let it be and go with the flow Pilgrim. Either way, once you are done with the car and house, focus all that extra cash towards the education cost. The good news is you achieve that goal more than 5 years before you need the money (green arrow – 99 months from now rather than the planned 168 months). And once that’s done, keep saving. Since you are easily able to save $1500 a month, you can continue that until you retire. If you do, you’ll have a sweet $300,000 extra for your retirement. Obviously, if you can save $3,000 a month (in the example above) from now until you retire, you should do so as long as it doesn’t put your life on hold. If you are able to save that much, you’ll end up with a lot more cash. But as I said, most people I meet are able to save more as they mature in their jobs. Over time saving gets easier. That’s why I like this approach. Identify and dollarize your goals. Apply all you have towards the nearest goal while maxing out retirement contributions at the same time. Once you’ve achieved goal #1, move on to the second. Rinse and repeat until you’ve checked off all the boxes. Yay you! What if you are in debt? If you have student loans and the rates are reasonable, you may want to continue paying those as a normal expense and still use the method I described above to motor your way towards your other financial goals. If you carry high-cost consumer debt, you may want to suspend all savings – including retirement savings if the situation is dire – and get that debt paid off. The higher the interest you pay, the more important this step is. For example, if you are paying 15% on a credit card, you should probably pay that off before doing anything. That’s because because once you do, it’s like you are earning a guaranteed 15% on your money. But as important as it is to pay that debt off, it’s just as important to be aware of why you fell into debt in the first place. Once you understand that, do whatever you have to do to make sure you don’t fall into the same trap. Unless you get out of debt and stay out of debt, you’ll find it almost impossible to advance towards your other financial goals. That’s too high a price to pay Pilgrim! I know it feels better to save towards future goals than to just pay off debt but it’s just better to pay off high-cost debt first. What if you can’t achieve your goals when you want to? a. Find a lower-cost way to achieve the goal. b. Give yourself more time to achieve the goal. c. Find a way to save more money by either earning more, spending less or both. d. A combination of all three of the above. Having said this, keep in mind that we still haven’t dived that deeply into retirement. We’re about to start that topic now. You’ll likely find, like most people I meet, that you’ll need a lot less money to retire than you might otherwise think. Your successful retirement is built on three pillars of your financial life; spending, income and assets. We’ll go through each of these topics now in great detail. What will it really cost you to live once you retire? Most people think saving and investing are the most important retirement concerns but spending is far more important. Think about it. You could earn $200,000 a year in retirement but if you spend $400,000, you aren’t going to stay retired too long. What makes it frustrating is that it is very difficult to know what it will cost you to live once you retire. If you plan to retire 10 or more years from now, how can you possibly know what you will be spending at that time? And even if you are retired now, you might be looking at a retirement period that will span decades and it’s even more difficult to estimate costs that are so far in advance. So, granted, this is an exercise in approximations – not certainty. But it’s far better to have a ballpark number than to have no number at all. You can and should re-examine and refine your estimates over the years ahead. Once you do this, you’ll have a map and the important milestones you need to focus on in order to ultimately reach your destination. But that’s only good for the current situation. Things change – like traffic. You need to update your path from time to time based on more current data. This is central; if you don’t do any projections or fail to update them you’ll be in the dark. 1. Track your current spending. 2. Adjust for likely spending shifts during retirement. 3. Use an online calculator to adjust for inflation. 4. Monitor and adjust over the years. Let’s discuss a few of these action items in greater detail. Some people recommend that you track every penny you spend to get an accurate measure of what it costs you to live. If you enjoy that because you are a nerd or square like me, that’s fine. But in case you don’t particularly dig this kind of grunt work, there is an easier way. You see, your bank statement summarizes what you spend each month. You can find that number on the “Total Withdrawals” at the top of your monthly statement. My suggestion is to track that number each month and compute the trailing 12-month average to get a good sense of what you spend each month. The reason why I like to use a 12-month average is because some months are more costly than others. You might have to pay your insurance in January and July as well as your property tax. So the monthly costs get lumpy. But if you look at the trailing 12-month average, you’ll get a pretty good idea of what you spend on average. .
b. Will your mortgage be paid off? c. Will you still support your kids? If not, how much will that save you? Also, keep in mind that you’ll probably spend 25% more on health care from 65 to 75 according to the Bureau of Labor Statistics. But the good news is you won’t have to save for retirement anymore and your taxes will likely decrease. This is a hypothetical example where Martha currently spends $7000 a month after tax now. But once she retires, she will have paid off the mortgage, she won’t have to save for retirement and she won’t support her kids anymore. On the other hand, she’ll spend more on travel and healthcare. Once Martha puts this all together, it looks like she’ll spend $4,000 a month in current dollars in retirement compared to the $7,000 she spends now. Now, all she has to do is to use that online calculator, apply an inflation rate (discussed below) and figure out what that $4,000 means when she retires 10 years from now. Any retirement plan that doesn’t factor in inflation isn’t a plan worth reading. Retirement is a very long-term proposition so inflation is a crucial element to figure in. Just as a refresher, inflation is when the price of a good or service rises over time without the good or service being enhanced or improved. Inflation is caused by a variety of factors that we don’t need to go into right here. All you need to understand is that generally, under most cases, prices generally rise over time. It stands to reason therefore that if you are dealing with a long period of time, your cost of living will probably increase in a meaningful way. If you don’t project out inflation and build it into your plan you could retire now in ignorant only to go broke 10, 15 or 20 years down the road. Yuk. Of course it’s impossible to know what inflation is going to be in the future. In the financial plans that I run, I use 2.5%. This number is higher than current inflation but lower than 3.22% which is the average inflation rate over the last 20 years as of the time I am writing this guide. If and when inflation heats up, I’ll increase the inflation factor I use when I re-run my clients plan. For now, you might want to use a number between 2% to 3.2% when you plug your numbers into the online calculator. Just remember to update your plan every 2 years at least and use the appropriate inflation number at that time. I hinted at the need to adjust your projections every couple of years. Here’s why. Over time, you’ll get better at tracking your actual monthly spending. Also, at the start you had to approximate how much you’d save and how much you’d earn on your investments. But after a few years you will have real historical data. Sure there will still be lots of estimates in your plan. But the more real history you have, the more accurate your projections can be. And as each year passes, you’ll have more actual data and fewer years you’ll have to make educated guesses about. That’s why it’s very important to update your plan every other year at the very least. What about important unknowns such as longevity, healthcare and retirement date? In order to know what is most important to do today, we have to make guesses about the future. The alternative is to do no planning what-so-ever and that is far worse than having a model based on unknowns. When it comes to retirement date, start off by planning to retire when you want to retire. After you create your plan, you may learn that this is impossible or you have to give up more lifestyle to do that than you are prepared to. If so, you can always change this input and re-run your plan to see what happens if you delay retirement. But we have to start somewhere. In terms of longevity, you are right that nobody knows how long they are going to live. In my opinion, the best idea is to rely on the government to tell you. (They hired an entire army of pencil-pushers and actuaries in order to get a good idea of how long you’ll be alive paying taxes and collecting Social Security so they have a better idea about this than you or I do). I admit that it is very difficult to guesstimate what your health costs are going to be over your life. For one, the costs seem to go up all the time. And for another thing, the healthcare system in the United States is in a state of flux. As I suggested above, it’s a good idea to figure you’ll spend at least 25% more on your healthcare when you retire than you are paying now. Now that we’ve covered retirement costs, lets dive into the topic of income during retirement. First, let’s discuss pension income. Fewer and fewer employees are offered pensions these days so if you don’t have one don’t feel left out. But if you are lucky enough to have a pension lined up, you could be in fantastic shape. I met with a woman who was greatly concerned about her retirement because she had accumulated so little in savings. But when she showed me her pension plan, I told her not to worry. Her pension would replace 80% of her income when she retired and Social Security alone would more than make up for the 20% shortfall. So your task now is to obtain a recent pension benefit statement and mark up your calendar to get an updated statement every year. The same thing goes for Social Security. Get a statement every year from the Social Security Administration and plug your numbers in your plan (as I’ll show you how to do). When it comes to the question of when to take Social Security, there is no “one size fits all” answer. On the one hand, if you take payments at 62 you forfeit up to 25% of the amount you would have received had you waited until full retirement age (FRA) which is 67 if you were born 1960 or later. And for each year you delay claiming benefits after 67, you bump up your monthly payments by 8% (up to age 70). In a nutshell, if you think you’ll live a long time and you can afford to wait, you should delay claiming Social Security up to age 70. If you need the income as soon as possible and/or you don’t expect to live well into old age, take the money earlier. If you know that you are going to work part-time after work, by all means plus those numbers in as well. Again, you might not know how much you’ll be earning or for how long. Be conservative but realistic and do the best you can to input that information. Many people rely on bonds, preferred stock, blue chip stocks and rental real estate to provide retirement income. There is nothing wrong with this in principal. And if you own any of these types of investments you should list them and project the income these will generate for you once you retire using the online calculators mentioned above. But it is very important for you to understand that rent, dividends and interest aren’t the only ways to generate investment income. You can (and probably should) consider tapping into equity growth to provide retirement income as well. Before I can explain this fully, we need to revisit the idea of investment risk. This is especially important when discussing retirement income planning. My experience tells me that once people retire or near retirement, they become more and more risk averse. This makes sense to me. You have fewer years to make up for big losses as you get older. And your existing portfolio is what makes (at least in part) your retirement possible. It’s obvious that you would want to protect that nest egg. I understand this sentiment but we need to widen our discussion a bit. As important as it is to protect your assets, it’s more important to do everything you can to make sure you don’t run out of money before you die. If you go broke in your golden years, the only thing golden about them will be where you work – the Golden Arches. Who wants to be flipping burgers or checking receipts at Costco in their 80’s? Not me. And probably not you. What I’m trying to say is that short-term volatility is indeed frightening; but long-term financial insolvency is far worse. People investing for retirement often like to put their money into bonds and/or bank CDs. The reason is the principal is guaranteed. While your principal and interest is guaranteed if you own FDIC insured CDs, bonds aren’t usually insured. That means if you own an uninsured bond and the company that borrowed your money goes belly up, you could easily lose all your dough and your income. And keep in mind that the income generated by CDs and bonds is usually fixed. That means the return won’t drop but it will never go up either. And remember, retirement is (hopefully) a long-term deal. In most cases, CDs pay little more than inflation. And when you consider both inflation and taxes, most CD owners end up going backwards. Bonds pay more interest than CDs usually but because they are not insured, they carry more risk. If the company behind the bonds goes kerplunk, so does your money. Also, if you need to cash in your bonds before they mature, you could receive more or less than you originally invested. Preferred stocks are very similar to bonds except they usually pay a bit more interest and they usually carry more risk. They have greater risk because in case of bankruptcy, the preferred share holders get paid only after the government, employees, creditors and bond holders get paid what they are owed. Usually, that means preferred share holders get left with nothing if the company goes belly up. The prices of preferred shares are usually quite stable. So if the common stock of company go up (or down) it usually won’t impact the preferred shares. In other words, people who own preferred shares don’t have an inflation hedge. Real estate can be a fantastic retirement income investment. It provides the potential for growth and the possibility to increase rents to keep up (or beat) inflation. The chief drawback is that it requires work and expertise. When you own real estate, you own a hands-on business. If you enjoy managing property, that’s fine. But if you don’t, it can turn into your retirement into a full-time nightmare. Of course you can always hire a property manager. And if you do and you are lucky, you’ll just reduce your income in exchange for saving time. However, in my experience, having a property manager is rarely a full solution. It’s just not the same as you overseeing your investment. You might reduce some of your duties as a property owner by hiring a manager, but that still won’t make it a passive investment. You can use equity growth to create retirement income. And if you don’t want to have to move in with your kids after you retire or be forced to go back to work, this is something you should learn more about. Here’s how it works in a nutshell. Invest in a balanced portfolio. At the end of each year withdraw 4% of the account value. Rinse and repeat. There was an exhaustive study done by 3 professors of finance at Trinity University. Weird as this may sound, they refer to this as the “Trinity Study”. These professors wanted to discover what was the best way to invest to create the most income over different periods of time without running out of money. This study was done in 1998 and updated several times since. The most important update was made by Professor Wade Pfau. While he made a few changes to the make up of the “balanced portfolio”, his conclusion was similar. If you withdrew only 3% of your portfolio, you (historically) ran very little risk of ever running out of money as long as you had at least 25% of your portfolio invested for growth. If you wanted 33% more income, you bumped up your withdrawal rate to 4% and (historically) had a 96% chance of NOT running out of money over the next 35 years. According to these studies, once you have a 50/50 allocation, the higher (or lower) percentage you allocate to growth, the lower your odds are of success. When it comes to retirement, you want security. No brainer….right? Well, if you can have a withdrawal rate that has historically provided investors with the most income possible and still have a 96% success rate, that’s pretty good in my book. Keep in mind that the shorter your withdrawal period, the higher your withdrawal rate could have been. That’s because you had fewer chances of encountering a huge market decline (although the risk is always there). Does a 4% withdrawal rate work? Can you invest your money in growth, pull out 4% of the year end value and generate retirement income for the rest of your life? Of course there is no way to prove that this will work. After all, we’re talking about projecting out years into the future and past results are no promise of future results. But we have to make some decisions about how to invest and I can’t find any better way to base my decisions other than on history. Flawed as it may be, what else is there? Below is a table that shows what happened if you invested $100,000 in 1988 into the S&P 500 and withdrew 4% of the year end value. Keep in mind that you can’t invest directly in the S&P 500 but for our purposes, let’s assume your S&P 500 ETF performed about as well. In 1987 you withdraw $4,000. In year 1988, you withdraw $4475 because your year end value is $111,878 – the investment did well that year. This progression continues nicely until 2000. Your income climbed over those years to almost $20,000 a year. But from 2000 through 2002, your income dropped by almost 50% to less than $11,000 a year. That’s hurts. You can see that the income climbs again until 2007 when it drops from $16,000 to less than $10,000 a year in 2008. It took another 8 years until the income tops what you were making 16 years earlier back in 2000. Inconvenient to say the least. I love this exhibit because it illustrates the pros and cons of using this strategy so well. First, you can see that the income is volatile. It’s not easy to see your income check drop by 50% from one year to the next but over the last 28 years, it did that twice. a. Using this approach, you will never run out of money. Remember, you are taking 4% out of the account at the end of the year based on year-end values. Whatever that value is, withdraw 4% and only 4%. This is safer than taking out a fixed amount – especially during those years when the market does poorly. b. Even though the income can be volatile at times using this method, investors received a heck of a lot more than they would have had they invested for a fixed return. For example, if you invested $100,000 at 4% fixed in 1988, you’d still be earning $4,000 a year in 2016 compared to our hypothetical $20,000. c. Using any online calculator you can see that this hypothetical investment grew your earnings by 5.92% a year. And the value of your investment grew from $100,000 to almost $520,000. That same $100,000 in a bond still has a maturity value of $100,000. When you consider inflation over that period was about 3%, the investor using equity growth to create retirement income should be pretty happy. Keep in mind that there are a few limitations with this exhibit. First, as I’ve said repeatedly, the past is no guarantee of the future. Second, also as I’ve said before, this investment approach leads to volatile income withdrawals. And third, the numbers I present above are for an all-growth portfolio and not the balanced one I suggested. None-the-less, this gives you a good look at what this type of approach could be like – during good and bad years. And if you are like me, you probably like the idea. You should only take as much risk as you absolutely have to in order to reach your goals. That means if you have plenty of income coming from other sources like pensions or other sources, why take any risk at all? Relax. The only reason a person in this situation should ever take on investment risk is if they want to grow their assets for their beneficiaries. On the other hand, if you are going to rely on your investments to provide retirement income, it makes sense to consider using equity for at least part of your portfolio as explained above. How much to invest in fixed income vs equity depends on your time frame and withdrawal rate (also, explained above). Do You Have An Income Gap? Let’s assume that you calculate that you’ll need $5000 before tax each month when you retire and that Social Security will bring in $1500. On top of that, we’ll assume you have $900,000 saved up which, at 4%, generates $36,000 a year or $3,000 a month. That means you will have $4500 coming in but $5000 going out – or a deficit of $500 a month. d. A combination of the three. You don’t have to decide this now, but the earlier you come up with a strategy, the easier it will be to implement. Often, when people are faced with this kind of information, they put their heads in the sand and “hope for the best”. If you do this, you are inviting the world to impose its “solution” on you rather than holding your power and taking charge. That is why I am such a believer in running projections like these for myself and my clients. And this is why I want you to either run your own projections or hire a qualified professional to do it for you – and update the plan every couple of years. It’s the best time/money you’ll ever spend. If you have a gap between your income and the amount you’ll need to retire on, consider selling your home and either downsizing or becoming a renter. I know this may seem drastic but consider it. Real estate is great while you are young because it provides tax benefits, forced savings, potential growth and stability. But when you retire, your needs change. You need income primarily and it makes no sense to keep all that equity (which translates into potential income) locked up in your walls. Let’s say you own a $500,000 home free and clear. What if you could buy a smaller home for $200,000 and free up $300,000. Using our model above, that $300,000 could generate an extra $12,000 a year (at 4%) or $1,000 a month income. If it’s between sitting in my $500,000 house and looking at the walls all day or scaling down and having an extra $1,000 to enjoy every month in retirement, I’m packing my bags now. When you consider all the costs of owning a home, you might go all the way and become a renter instead depending on the market you live in and your unique situation. What About Complications and Unexpected Events? I’ve been running financial plans for decades and I know that nobody has a simple situation. There are always one-off events that significantly impact your financial plan (for the better or worse). These include things like moving once you retire, selling the house and either downsizing or renting, inheritance, helping the kids etc. In addition, once people retire, they have different spending patterns. In a nutshell, young retirees spend more on travel and entertainment but start scaling back in their later 70’s. On the other hand, older retirees often need to spend more on health care and assistance. You can still use the methods I explained above to calculate these costs but it is more complicated. If your situation is complex or beyond your comfort level for whatever reason, it’s worth your while to work with a professional planner to build this for you. What if the market dives during or right before you retire? When the market deals you a terrible hand, it’s easy to freak out. This is especially true if you are retired or just about to retire. But getting emotional is the worst option possible. At that time, more than ever, it’s important to keep a cool head. In most cases, the best answer is to stay the course unless your investment decisions are the cause of the losses. In the past, the biggest rallies occurred right after the bear market ended. That’s no guarantee of the future of course. But it’s important to understand. A good example is what happened in the early 1970’s. The market lost 38% in the 12 months ending in September 1974. The market soared 38.1% over the next 12 months. But how long would it take to get back to even? If you had $10,000 in September 1973, it would be worth $6,110 12 months later. A year after that it would be up to $8,438. But two years and two months after that, your account value would be over $10,000. No doubt…this roller coaster ride would have been very uncomfortable to sit through. This was particularly true if you used the money to generate retirement income. In that case, it was imperative to use bear market withdrawal strategies. But at the end of the day, you had to be in the market in the beginning of the rally (when things seemed the very worst) in order to get the maximum recovery potential. Of course, not all recoveries are so explosive and powerful, but waiting can be dangerous. Of course, I can understand why people are gun-shy at times. You’d have to live in a cave not to be shell-shocked when things get ugly. But please, when all the geniuses on TV tell you it will take 20 years for the market to recover, ask yourselves why these brainiacs didn’t predict the 2008 meltdown in the first place? 1. If you can delay retiring, consider it. You might boost your Social Security benefits, have more years to fund your accounts and reduce the number of years you’ll draw on your accounts. 2. Cut spending. Make sure you get rid of your debt before you retire. 3. Consider working part-time. What if you are already retired? Why not consider part-time work? It certainly couldn’t hurt you…right? When the market cascades painfully lower, things will seem hopeless – but they won’t be. That’s what history demonstrates time and time again. There is a time to sell your equities of course. But it’s probably not during market panics. And remember that you have a much longer investment time frame than you think. If you are 65 years old today and draw on your accounts, how long will you draw on them? Maybe 20 or 30 years…or more. Do you have time to make up those losses? Yes…you certainly do. It doesn’t feel like that….but it is true. The chart below summarizes previous market declines and how the market did shortly thereafter. This is of course no guarantee of future results. It does however make a strong case for what I’m trying to say above: the riskiest course of action after big market drops is to stay in cash. Once retirement is within reach, you goal isn’t to retire rich. Your goal is to survive while maximizing your retirement income. If the market dives, there is still no reason to panic. You have options. Above, I talked about using a balanced portfolio to create retirement income without taking on huge risk that you’d run out of money. (This is not to say that you should invest you money this way, and it’s certainly no guarantee of future results. There may be better alternatives for you.). There was another study done by T.Rowe Price, the Baltimore-based fund company, and it also looked at withdrawing 4% of your account for 30 years and giving yourself a 3% raise each year for inflation. We looked at this earlier and found that historically, your success rate was 90% using this method. This system works just great under normal circumstances. But if your account values drop by 30%, your 90% “success” rate plummets to 40%. In other words, if you continue taking those withdrawals after suffering huge losses, the chances of celebrating your 80th birthday at McDonald’s skyrockets — and the bad news is you’ll be serving the fries…not ordering them! Most people understand this intellectually, but the problem is they don’t think it all the way through. They freak out and freeze up. They figure they’ll work forever or go live in a cave or do both. Don’t fall into this trap. Here are three options the study suggests that may change the picture entirely. Delay taking your 3% cost-of-living adjustments for five years. This increases your odds of retirement success from 40% to 60%. I agree that it’s not enough, but it’s a move in the right direction. Delay your 3% COLA increases and cut your withdrawals by 10%. So in the example above, if you were withdrawing $4,000 each year, cut it down to $3,600. Same as Option 2 above, but rather than cut your withdrawals by 10%, give yourself a 20% reduction. If you do this, your odds of never running out of money go up to 87% — which is just about as good as they were before the whole market mess started. Remember that each of these options only call for cuts during the first five years of retirement — not forever. So how do you make up for that reduced income? You can cut your spending, work-part time, get a second job or some combination. My main point is that things rarely are as bad as they look. It’s tempting to overreact — I get that. But it’s really important to examine the facts and respond accordingly. As in most other problems we all face, there are usually plenty of solutions. This is just one example of how important it is to stay present and be open to alternatives. And most important, don’t let the fear of a great market plunge keep you from investing appropriately. You have all the information you need in order to build and execute a successful retirement plan. Sadly, information isn’t usually enough to get the results people want. My experience tells me that the people who succeed at retirement planning have a few more crucial ingredients. The most important of these is of course commitment and action. It takes time and hard work to hammer out a good plan. Without commitment, many people throw in the towel and give up. That’s a shame because the retirement lifestyle of those who have a plan and stick with it is usually so much better than those who wing it. My suggestion? Tell someone else what you are doing and commit to them. Ask them to hold you accountable on a timeline and have regularly scheduled meetings to make sure you are still on track. This is what I do with my clients and it’s the secret-sauce that makes it work. You can of course hire someone to do that but you don’t have to. Whatever you decide, commit and get accountable to someone other than yourself who won’t let you off the hook so easily. Next, expect to hit a few road bumps along the way. When it comes to retirement planning, there are so many unknowns and unknowables, that it is impossible to lay out a plan in stone. You are going to have to be flexible and roll with the punches once in awhile. That’s why it’s so important to revisit your plan every couple of years – to make sure you are still on track. I know you can do this. Start today. Take action – any action – that moves you towards having an effective retirement plan. Life is short. Certainly far too short to waste time worrying when all it takes is a little elbow grease to put your plan in place. I believe in you. I know you will succeed and I look forward to hearing from you and answering your questions.